Bryce Taylor, left, and anaesthesiologist Raynauld Ko review the checklist. © Michael Stuparyk/Toronto Star. 2009. All Rights Reserved. Each year an estimated 234 million operations are performed throughout the world. Associated surgical complications account for a substantial burden of disease. 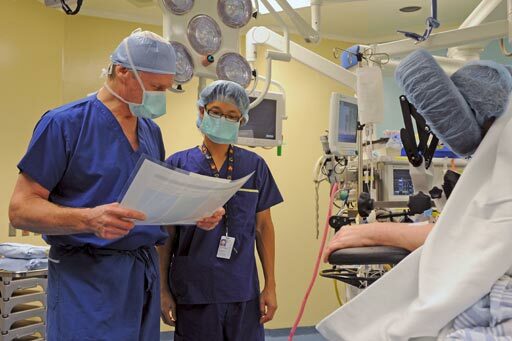 The Toronto General Hospital (UHN) Department of Surgery participated in a prospective study of the impact of a Safe Surgery checklist, sponsored by the World Health Organization (WHO). The Checklist reduces complications. General surgeons, broadly educated and capable of performing a wide spectrum of surgical procedures, have long been the backbone of hospitals and the surgical community. Hospitals are outsourcing their expertise. Members of my specialty are receiving increased attention to their financial relationships with manufacturers of expensive intracardiac devices. Guidelines are necessary but insufficient. Laparoscopic general surgeon Allan Okrainec's research focus is on the use of simulation for surgical education in the developing world. Robert Nam and Arun Seth have discovered a gene fusion that occurs specifically in aggressive prostate cancers and is expressed in circulating tumour cells. A stirring debate on the role of industry funding in surgery was the highlight of the winter quarter dinner meeting of the St. Michael's Hospital surgery department. Quality improvement is elusive in individual surgical practice because variations are hard to recognize. Regional practice collaboratives are working. Karen Davis (NeurSurg) has been appointed Associate Director, Institute of Medical Science effective January 1, 2009. Michael Fehlings (NeurSurg) was the celebrated researcher at the 2008 American Association of Neurological Surgeons Annual Meeting in Chicago which was highlighted in the 2008 AANS Annual Report.